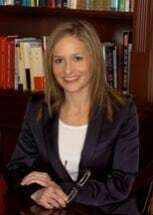 JAMIE L. GINGOLD is a 1998 honors scholar graduate of Tulane University, Newcomb College in New Orleans, Louisiana and a 2001 Dean's Honor List graduate of Chicago-Kent College of Law. Ms. Gingold was admitted to the State Bar of Georgia in December 2001; and Georgia and U.S. District Court, Northern District of Georgia, in April 2002. Ms. Gingold is a partner at Gingold & Gingold LLC, where she represents individuals in consumer and corporate bankruptcy filings under Chapters 7 and 13 of the United States Bankruptcy Code. In addition, Ms. Gingold counsels individuals and companies on financial management in the event filing bankruptcy is not an option for a client. She is a member of the Atlanta Bar Association (Bankruptcy Law Section); the State Bar of Georgia (Bankruptcy Law Section); American Bar Association; National Association of Chapter 13 Trustees (NACTT); National Association of Consumer Bankruptcy Attorneys (NACBA); Metropolitan Atlanta Consumer Bankruptcy Group; International Women's Insolvency and Restructuring Confederation (IWIRC); and Georgia Network of IWIRC. Ms. Gingold has been an active member of the Georgia Network of IWIRC since April of 2005. She is currently the Secretary of the Georgia Network of IWIRC and continues to serve on the board. Ms. Gingold has served on the Board of Directors of the Southeastern Bankruptcy Law Institute (SBLI) since 2013. The SBLI presents the country's largest annual seminar on bankruptcy law and rules. This is a national seminar attracting more than 500 bankruptcy attorneys, Trustees, and Judges from around the country.